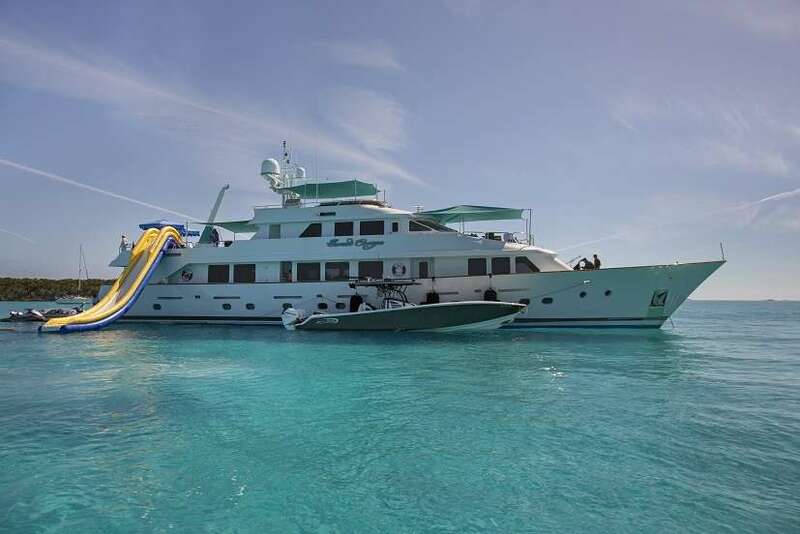 SWEET ESCAPE can accommodate 10-12 guests in 5-6 staterooms (3 King, 2 Convertible Twin/King, 1 single plus 1 bunk), with 5 ensuite bathrooms. 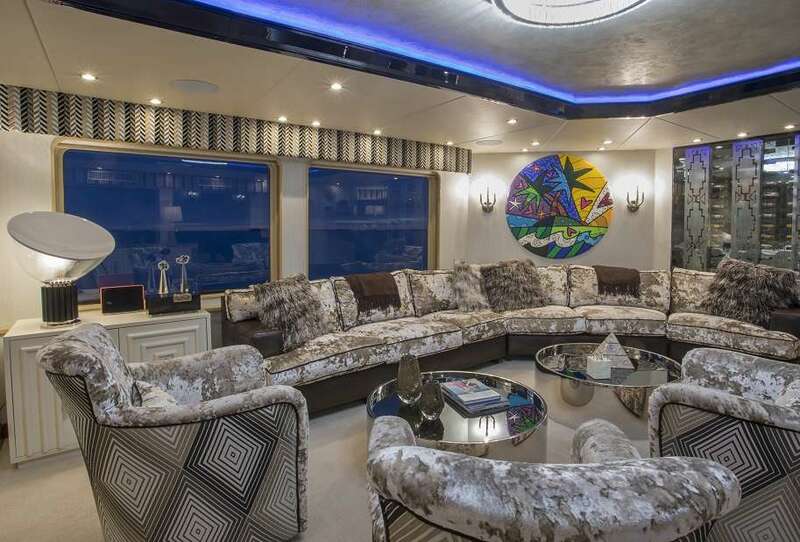 MASTER STATEROOM: Lower Deck, amidships. 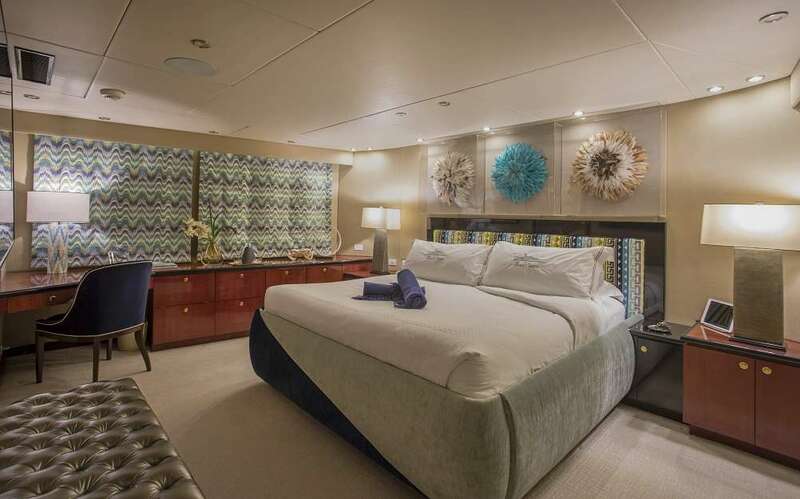 Full beam Stateroom with walk-around Sleep Number� King bed,mini-refrigerator, desk, and settee. 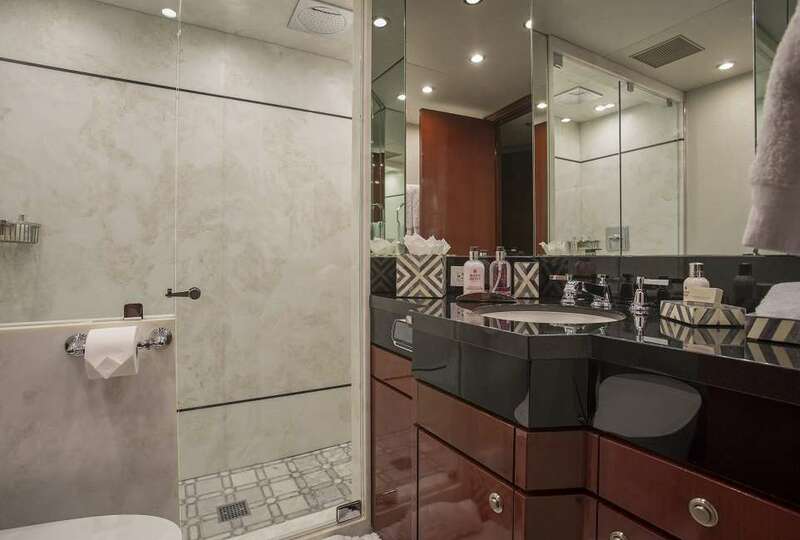 Separate His-and Hers en-suite amenities featuring: Jacuzzi tub with overhead shower, sink, head, walk-in closet, and vanity dresser for Her; Steam shower with bench seat, head, sink, and walk-in closet for Him. Entertainment system featuring Bose surround sound, 60�HDTV with individual satellite receiver, and iPod docking station. 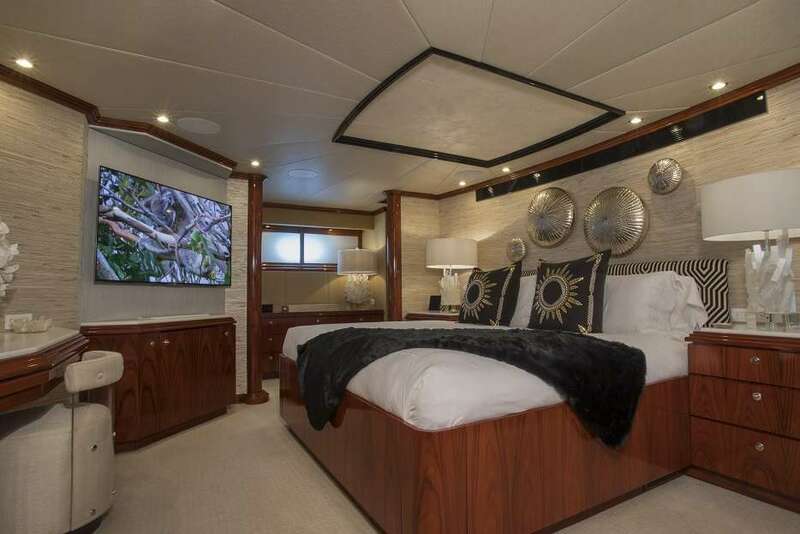 Port holes in the master stateroom as well as his-and-her en-suite create abundant natural light if desired. Complete blackout option also available. ON-DECK VIP KING STATEROOM: On-Deck, forward: Sleep Number� King bed with exquisite views; en-suite with stall shower. Entertainment system featuring Bose surround sound, 55�HDTV with individual satellite receiver, and iPod docking station. LOWER DECK VIP KING STATEROOM: Situated mid-ships to aft. Full beam Stateroom with walk-around Sleep Number�King bed. En-suite features over sized shower with bench seat, head, and sink. Entertainment system featuring Bose surround sound, 50� HDTV with individual satellite receiver, and iPod docking station. CONVERTIBLE TWIN/KING STATEROOM TO STARBOARD: Lower deck amidships: Two twin-sized beds (extra-long) convertible to 1 King bed; en-suite with shower. Entertainment system with Bose surround sound, 36�HDTV and iPod docking station. CONVERTIBLE TWIN/KING STATEROOM TO PORT: Lower deck amidships: Two twin-sized beds (extra-long) convertible to 1 King bed; en-suite with shower. Entertainment system with Bose surround sound, 36�HDTV and iPod docking station. This stateroom shares the en-suite bathroom with the 6th guest stateroom. 6th Guest Stateroom: One Single bed with adjacent bunk bed to accommodate children or staff. Hanging locker and drawers, 36� HDTV with individual satellite receiver. 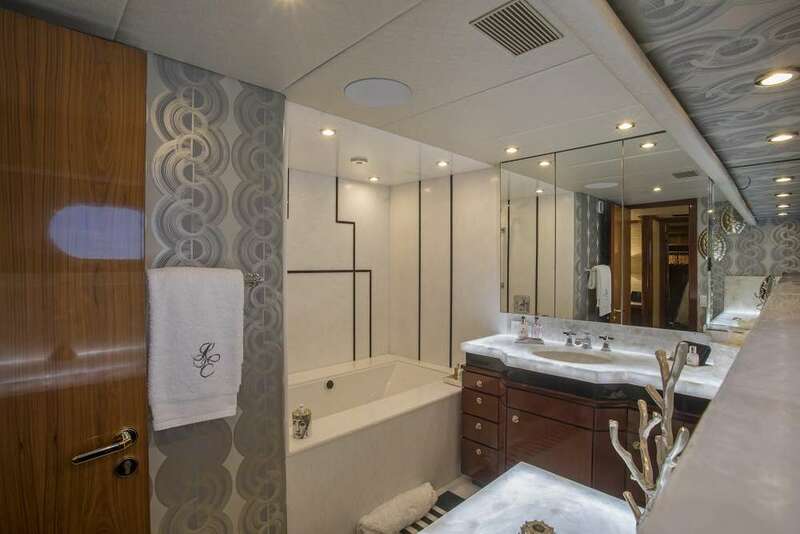 This stateroom shares the en-suite bathroom with the Port side King/Twin Convertible Guest Stateroom. All staterooms include individual satellite receivers, individual climate control, robes, hairdryers, and luxury bath products. 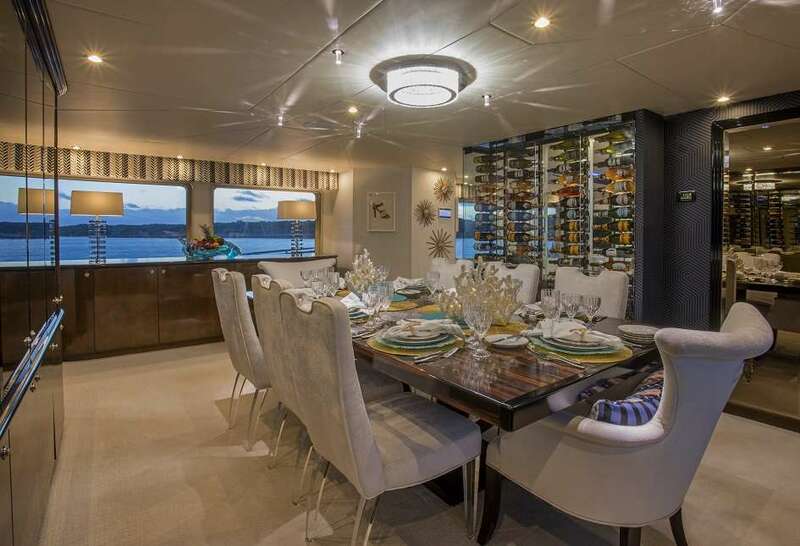 AFT DECK: Covered, al fresco dining for 12. 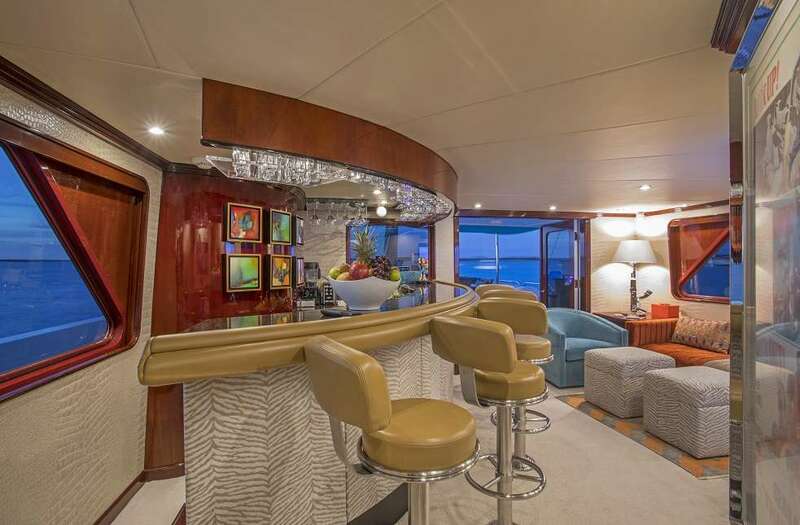 Full wet bar with fridge and sink, 50� HDTV with individual satellite receiver, and iPod docking station. Access to the swim platform on the starboard side. Passarelle for Med-style boarding. 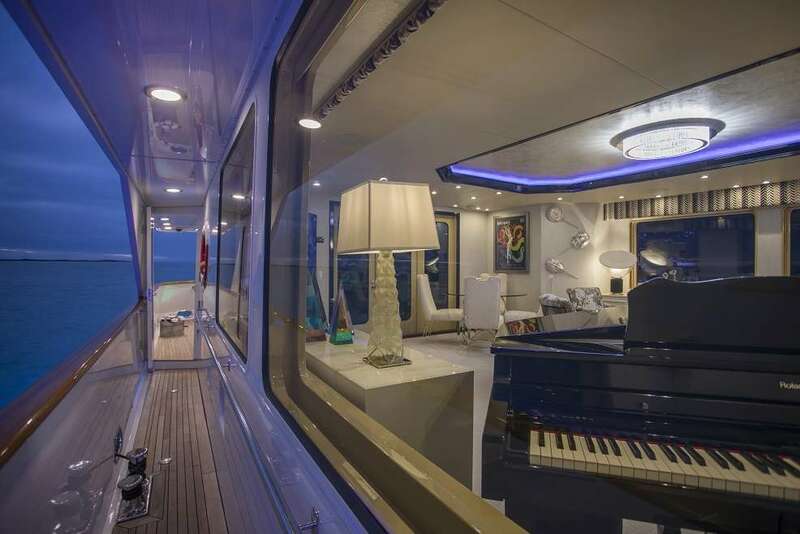 The aft deck has the ability to be enclosed with Eisenglass as well as heating/air-conditioning. Underwater lights. Walk-around decks to bow. SALON: Large Salon with ample seating areas, game table for 4. Entertainment system with Bose surround sound, 75� HDTV and iPod docking station. FORMAL DINING: Adjacent to the Main Salon, with a magnificent rectangular dining table comfortably seating 10. PORTUGUESE BRIDGE hosting a magnificent semi-circular shaped seating area. A private space to enjoy the spectacular sunsets! SKYLOUNGE on BRIDGE DECK: The skylounge has a superb full bar with bar stool seating for 5. Comfortable lounge area with Bose sound, 60� HDTV and iPod docking station. BRIDGE DECK AFT: Full sun, but with the ability to create shade with optional sun shade sail triangles. Al fresco dining for 10, chaise lounges, access to sun deck or walk-around to Portuguese Bridge. SUN DECK: Full sun, but with the ability to create shade with optional sun shade sail triangles Port and Starboard settee seating. 6-8 person Jacuzzi, and sun pads. After full refit, new Interior and Exterior Photography is scheduled for March 2017. All new Marketing tools to follow soonest.